I would really love to write while listening to Joanna Newsom, but for all intents and purposes this is utterly difficult since when you leave me alone… I mean I keep writing lyrics instead of relevant information. That is enough publicity for this extremely talented musician. Time to talk business. For example it is bad business to neglect your main program feature with every program update. 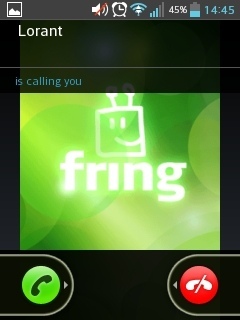 Fring as the name implies is on the fringe of being a breakthrough from VoIP apps (Skype, Viber). Among the standard selection of features, Fring explores the possibility of holding video conferences over multiple platforms (iOS and Android mainly). It's an uncontested niche since Skype decided not to include this great feature in its mobile incarnations. Fring separates your contacts into "All" and "fringers". Besides not being politically correct, it adds insult to injury by not recognizing tablets as legitimate fringers. This restricts accessing a fringer tablet through the history sections only (Texts & Calls) as they cannot be added as Favourites either. Leaving this issue behind, Fring is a decent looking app although it doesn't excel at anything in particular. 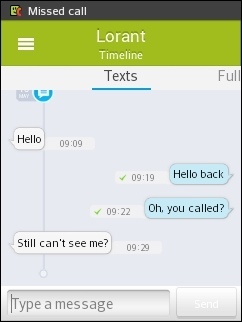 The messenger function offers no other option than to chat but it can also incorporate call history if that is relevant. When calling someone you have the option of using your established carrier rates or Fring's "almost free" rates (which are really comparable with other VoIP offers). Fring has that old school stile of adding nothing extra. No stickers, no random chats, no silly stores. No emoticons either. You make calls and chat. That's it. Fring stands out as being the only app that offers group video calls on mobile devices but the overall audio quality is somewhat lacking. Still, if you want no distraction, you can find serenity in Fring.